Make the gremolata. Zest the orange and lemon, peeling in long strips. Finely chop one strip from each. Mix with the rinsed and dried parsley leaves, the powdered almond and minced garlic. Season with cayenne pepper, salt and pepper. Using a brush, lightly brush the meat with a little olive oil. Sprinkle all sides with crushed green peppercorns, pressing firmly to adhere. Heat the barbeque to a high heat. 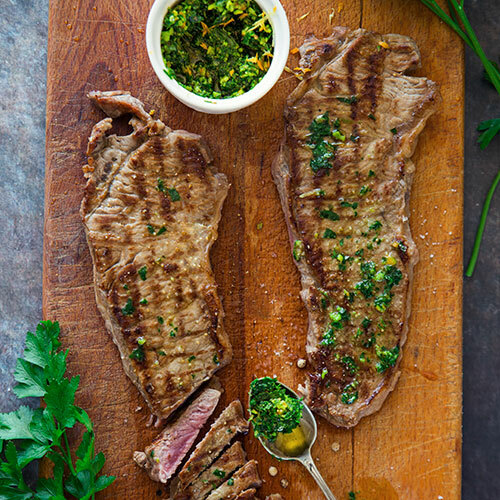 Grill the meat for 1 minute and 30 seconds on each side, then set aside on a cutting board for 5 minutes. Slice in 1-2cm strips. Transfer the slices to a salad bowl. Season with gremolata and serve immediately.